Snow is great fun. Snowball fights, snowmen, sledging – it brings out the child in all of us. As adults, however, it does present some challenges, particularly when it comes to driving. But, if you know how to drive in snow, many of these can be minimised. There are things you can do before you set out, as well as precautions you can take once you’re on the road. Knowing how to drive in snow will not only keep you safe but it will help you enjoy the drive. Think about what you’re wearing on your feet. The soles of your shoes should be clean and dry so that your feet don’t slip on the pedals. Check that your tyres are at their correct tyre pressure. 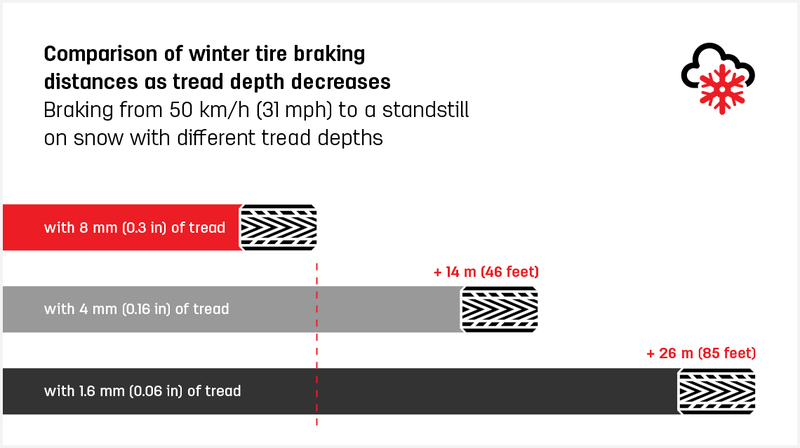 Your tread depth is extremely important in the snow. Make sure you are compliant with the local laws in terms of winter/all-season tyres and/or snow chains. Our tyres begin life with 8mm of tread. While many local laws stipulate that they must be replaced at 1.6mm, we recommend a minimum depth of 3mm on summer tyres and 4mm on winter tyres. Always clear snow and ice from all windows, mirrors and lights. If necessary, use lukewarm water or de-icer but never use boiling water as it could melt plastic and rubber components and damage electrics. Clear any snowfall from your car roof. If you have to break suddenly, you do not want your view hampered by a clogged up windscreen. Make sure your screen wash bottle is topped up with sufficient additive. Check that your wiper blades are clean and in good condition and keep them switched off until after you’ve cleared your windscreen. Pack a winter emergency kit (warm blankets, sand, snacks, a snow shovel etc.) in case of difficulties and think about carrying some snow chains or snow socks or even a bit of carpet to put under your drive wheels to help gain traction if you’re stuck. For more information, read our article what to do if you’re stuck in snow. For more information, read our article What to do if you’re stuck in snow. If you’re using winter tyres, make sure you have more than 4mm tread depth. Learning how to drive in snow often comes down to common sense. Even with the best winter tyres, you will need to allow for longer braking distances than you would on dry roads. So, keep a big distance between you and the car in front (up to 10x the normal distance recommended) and allow plenty of time to stop and steer. Avoid situations where you may end up wheel spinning as this could result in you getting stuck. Accelerate gently, using low revs and change up to a higher gear as soon as possible. Pulling off in second gear can also help to reduce wheel spin. Everything should be done smoothly and slowly – braking, steering, accelerating and even changing gear. If you have them, make sure you use your daytime running lights so it’s easier for other drivers to see you in the snow. This is mandatory is some European countries and recommended in others. Please check the local laws. If you’re following other vehicles on an ungritted road, it is better to drive on the fresh snow, rather than on their wheel tracks. The compacted snow will be icier than the fresh snow. If you skid, gently steer into the direction of the skid. If the back slides to the right, steer to the right. Keep your hands on the steering wheel and do not be tempted to slam on the brakes.